DHCP, or Dynamic Host Control Protocol, is the service used to hand out IP addresses and other network settings by network appliances and servers. 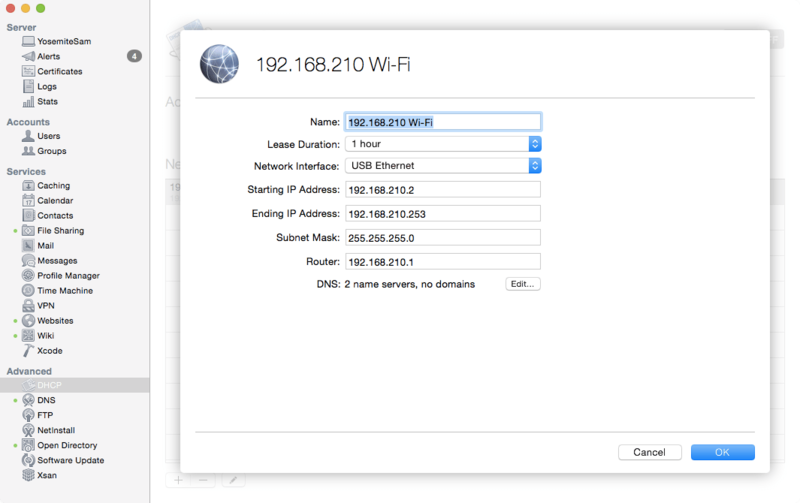 The DHCP Server built into OS X Server 3, installed on Yosemite running the Server app (aka Yosemite frickin’ server) is easy-to-use and fast. It’s pretty transparent, just as DHCP services should be. To install the service, open the Server app and then click on the Show button beside Advanced in the server sidebar. Then click on DHCP. 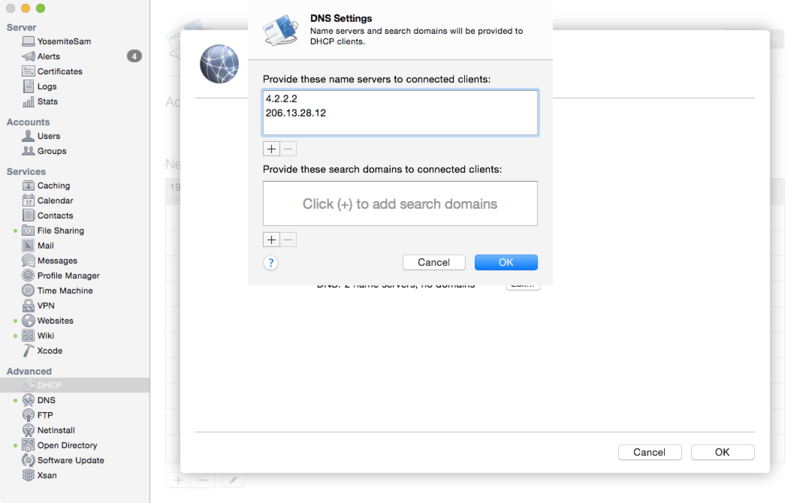 At the DHCP screen, you’ll see two tabs: Settings, used for managing the service and Clients, used to see DHCP leases in use by computers that obtain IP address information from the server. You’ll also see an ON and OFF switch, but we’re going to configure our scopes, or Networks as they appear in the Server app, before we enable the service. To configure a scope, double-click on the first entry in the Networks list. Click OK to save DNS settings and then OK to save each scope. Once you’ve build all required scopes, start the service. Once started, verify that a new client on the network gets an IP. Also, make sure that there are no overlapping scopes and that if you are moving a scope from one device to another (e.g. the server you’re setting up right now) that you renew all leases on client systems, most easily done using a quick reboot, or using “ipconfig /release” on a Windows computer. If you have problems with leases not renewing in OS X, check out this article I did awhile back. 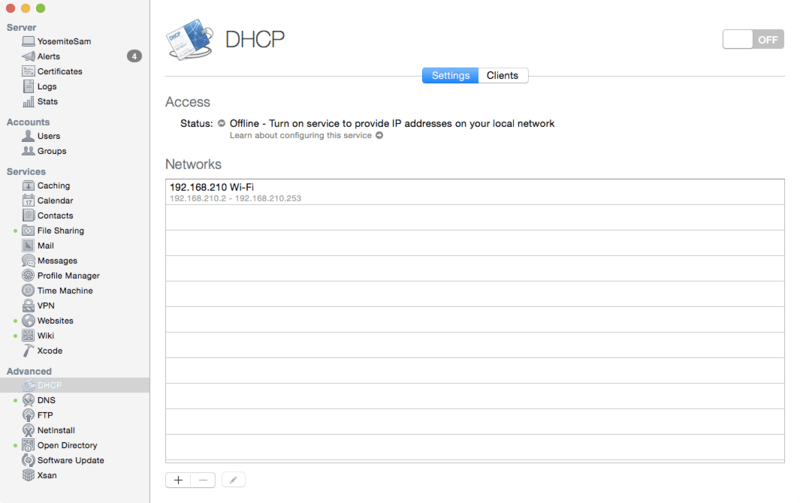 dhcp_enabled – Used to enable dhcp for each network interface. Replace the immediately below with en0 . For additional entries, duplice the string line and enter each from ifconfig that you’d like to use dhcp on. Subnets – Use this array to create additional scopes or subnets that you will be serving up DHCP for. To do so, copy the entry in the array and paste it immediately below the existing entry. The entry is a dictionary so copy all of the data between and including the and immediately after the entry for the subnet itself. dhcp:timeOfModification = "2014-10-04 04:24:17 +0000"
dhcp:timeOfSnapShot = "2014-10-04 04:24:19 +0000"
dhcp:timeServiceStarted = "2014-10-04 04:24:17 +0000"
On the clients, you can then use ifconfig followed by the getpacket verb and then an interface connected to the same network as the DHCP server in order to see the information supplied by the dhcp service, including the system that provided the DHCP lease to the client computers.